Null Pointer – Page 20 – My views on technology, Internet and current-affairs. It seems Barcamp Pune will surely happen in June. I have been involved at the early stages having created the Wiki and the Yahoo group but then stealing time for the event has become increasingly difficult. The present teams of organizers seem to have zeroed in to two venues, both choices are good. The list of attendees has been swelling steadily and there is a good variety in the topics added to the wiki so far. 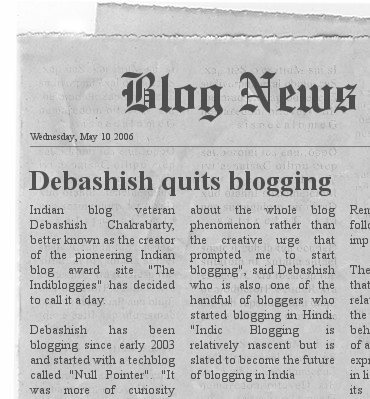 I have decided to speak on “Indic Blogging: Opportunities and Challenges” and I hope I am able to prepare something good. If you are in Pune on June 17 do drop-in, details of Venue would be updated at the BarcampPune wiki. You may also join the BarcampPune mailing list. WordPress Sidebar Widgets have been the latest buzz in the blogdom. Indeed these Widgets elevate WordPress’ standing among the blogwares and encourage community to contribute to the project. With Sidebar widgets, things have become as easy as drag and drop, though you would need “widget compliant” themes. I still wish WordPress had done something with the widgets, the Logahead way, eliminating the need of an admin console altogether, though many would disagree with me saying Logahead is too simplistic to compare, and I may even agree to that argument. The great part about Widgets is that developing them would be pretty straightforward. No wonder so many widgets have started popping up, they had to create a directory of sorts. Which brings me to the one I created in a jiffy. Click here to get the IFrame Widget from WordPress Plugins Directory. This simple IFrame widget can display any external HTML page inside an HTML IFrame component. The need came from the Hindi Tagcloud JSP that I had once created for Chittha Vishwa and I always thought that there should be some way to display that page on my blog (if you are as lazy to edit your blog theme files, you would agree with me). If you would like to use the Widget the very first thing to do would be to make your Blog Widget ready. Then you can download the IFrame Widget code from WordPress Plugins Directory, and drop it inside the wp-content/plugins folder of your WordPress installation. Once you activate the “My IFrame Widget” plugin you are ready to use it as shown below. The Width, Height and of course the URL are configurable in the Widget. To deploy the Widget simply Drag and Drop as shown. Next you must configure the Widget. Supply the Title, width, height and the URL of the page that should be displayed inside the IFrame. An IFrame widget in action on the blog sidebar. Disclaimer: The information provided on this page comes without any warranty whatsoever. Use it at your own risk.